Laughs on Fox: Stand-up comedy show doesn't pay its comics. 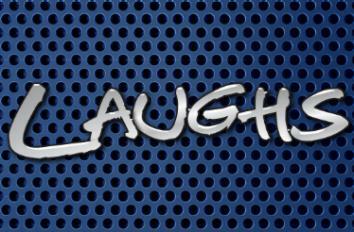 The logo for Laughs, a new TV series. Laughs is a new comedy showcase series airing on 11 Fox TV markets nationwide. It premiered on Aug. 2 and is running on Saturdays at 11 or midnight in most markets. Each half-hour episode features stand-up performed in clubs across the country. The show is part of Fox’s new minor league-style in-house development plan, in which affiliate stations crank out first-run syndication shows so cheaply that the production costs are practically guaranteed to be offset by ad revenue. If a show takes off, they’ll make a bundle. But the shows will be profitable regardless of ratings, even if they only play in a few cities. How does Laughs keep its costs down? By not paying its comics. Laughs is certainly not the only first-run syndication show that keeps profits up by slashing its budget. But most such shows come from unscripted genres—talk and game shows, popular genres for syndication precisely because of their low production costs. These shows are shot quickly in-studio and have limited creative teams. And because most talk shows purport to serve a news function, guests are usually unpaid. But Laughs is straight entertainment—it may not call for a writing staff, but it still depends on content creators. Each episode includes performances taped specifically for the show, as well as video content created by comics. Set lengths vary; some are as short as one minute. The show shoots at several different clubs, including Louisville’s Laughing Derby, co-owned by the show’s executive producer, Steve Hofstetter. But it doesn’t set any rules on comic pay at those clubs. Headlining a club show may be lucrative, but other slots can pay $25 or less. The show’s minuscule $8,000-per-episode budget, for a non-talk show filmed in multiple cities, is simply too low to make a program that is just and fair for those involved. While the production crew is paid—albeit at a rate, according to Hofstetter himself, lower than their usual standard—a whopping $0 is allotted for performer payouts. Zero is less than the minimum wage for SAG-AFTRA (Screen Actor’s Guild and American Federation of Television and Radio Artists), and so the union issued a “Do Not Work” notice on Aug. 5 forbidding union members from appearing on Laughs. Non-union shows, especially in syndication, are not terribly unusual. But not paying stand-ups for appearing on television is rare. Even Gotham Comedy Live, a taped club showcase like Laughs that airs on tiny AXS-TV, pays union rates. And this is a hard-won reality. For decades, comics have had to fight for reasonable compensation. Back in 1979, performers at the Los Angeles Comedy Store went on strike for six weeks until the club finally agreed to shell out $25 per spot at its shows. When comic Ted Alexandro wrote a petition to New York City clubs in 2002, weekend slots were bumped to $65 after being fixed at $50 for nearly two decades. Many of the 120 comedians that signed it organized the New York Comedy Coalition to advocate for fair treatment, but controversies continue: AFTRA has renegotiated terms for stand-ups many times since over labor issues like residuals, show formats, and new media. Last year, the Upright Citizens Brigade Theater’s no-pay policy sparked extensive public debate. We’re a non-union show by choice, and have always been up front about it. There are dozens of non-union shows, and that’s okay. If we were a union show, we couldn’t break new comedians. Imagine telling a young comedian that he or she gets to be on TV for the first time, but has to spend $3,000 to join a union in order to do so? As many Reddit users pointed out, this notion that comics would have to pay $3,000 to perform on a union show simply isn’t true. Actors are not required to join SAG-AFTRA for the first union job they book. And when they do, there are installment-based payment plans available for the $3,000 fee. Were Laughs to compensate its comics according to SAG-AFTRA minimums, Hofstetter estimates it would take half the budget. He told Redditors that he requested a higher production budget, but was turned down. (Churning out cheap content as a vehicle for ad sales appears to be the whole point of this in-house development strategy: The show’s promos even poke fun at its own paltry budget.) He also said he is reinvesting his own pay back into the show to cover production costs. But the nuanced economics of in-house syndication development are sure to be lost on many people, whose takeaway will be that that Fox has proven that comics will work, even on television, for free. Any doofus knows how valuable the right exposure can be. But that doesn’t make it ethical compensation. And not getting paid at the UCB Theater—which arguably fosters a community for artistic development—is one thing. But a massive corporation boosting its numbers by exploiting labor to make content for next-to-nothing is, quite simply, shameful. If you’re not even getting paid on Fox, you aren’t working your way up, you’re climbing a ladder with regenerating rungs. By the time it’s on TV, a stand-up set has already taken years to build. It didn’t trudge through years of open mics, hecklers, and bar shows to be branded as low-budget, off-season filler. It’s too valuable for that. Update, Dec. 5, 2014: On Facebook, Steve Hofstetter has announced that Laughs was picked up for 20 additional episodes, some of which will incorporate previously aired material. In a separate post, Hofstetter writes, “Every artist who appears on the show will be paid for their appearance, right down to Tweets and Vines.” He has not provided details about payment; we will update this post again if we learn more.